BUILDING LAND FOR SALE IN THE FAMAGUSTA REGION OF NORTH CYPRUS. An opportunity to purchase this plot of land in a prime location in the Famagusta region of Northern Cyprus. This plot has potential for a variety of uses as the build permission is 50%. Located just outside of Famagusta city adjacent to the Nicosia to Famagusta road it could be suitable for development as residential, or retail or leisure purposes or simply as an excellent investment. Electric and water are close by. The Famagusta region of Northern Cyprus has so much to offer. From the fascinating old walled city with its numerous shops, restaurants and bars then driving north past the ruins of ancient Salamis passing miles of sandy beaches coming to the picturesque fishing harbour at Bogaz and then onwards to the magnificent Karpaz peninsula where some exciting developments are taking place firstly at Bafra with 15 new themed hotels under construction and then on to the Karpaz Gate Marina. All this and some of the most beautiful beaches in the world, yes, Famagusta seems to offer everything. Famagusta is one of the most important, greatly fortified ports on the shores of the Mediterranean. To the north of Famagusta lie the fabulous ruins of Salamis. This one great city is believed to have been founded in the 11th century BC and after the influences of the many conquering nations, notably the Romans, the city was finally abandoned in 648 AD following the combined catastrophes of earthquake and raids by Arab pirates, when the population moved to Famagusta. The spectacular ruins give a fascinating insight into long-lost civilizations and include a magnificent amphitheatre, Roman baths, a gymnasium and royal tombs. The mosaics are particularly beautiful. Ravaged by war and earthquakes, the old walled town is now only partially inhabited, but it contains some of the finest examples of medieval military architecture extant and the 14th-century Gothic-style Cathedral of St. Nicholas, now a mosque. But nowadays the city comes alive at night with trendy cafes, bars and restaurants offering international cuisine as well as the traditional Cypriot food. Clubs and restaurants have traditional music as well as performers travelling from further a field to satisfy the tastes of all age groups. Close by the Eastern Mediterranean University, (E.M.U.) offers opportunities to an investor to tap into this market of both overseas and local students. Ercan Airport is just a 30 minute drive away and Larnaca airport, in south Cyprus is about an hours’ drive away. The exciting new water supply pipe under the sea from Turkey using pioneering technology can only add to the future prosperity of Northern Cyprus and we believe will also add value to property and land investments here. 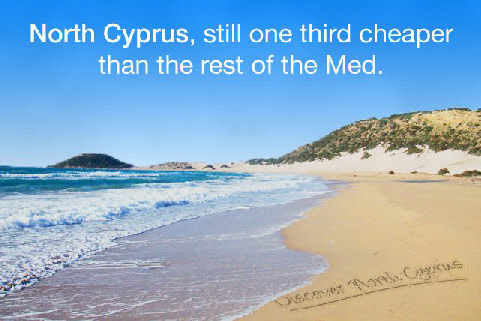 Many people are buying land in North Cyprus for investment purposes. There are no complicated concepts that investors need to understand with land, just that there is an ever-increasing demand for building and a restricted supply of plots for sale. Land prices have risen faster than equivalent house prices. Sorry-This has been sold or withdrawn but we have more. Click to see.